Houses of Worship | Center Line Technologies, Inc. Practically every worship setting today incorporates some level of audiovisual technology to better engage its congregation. And why not? 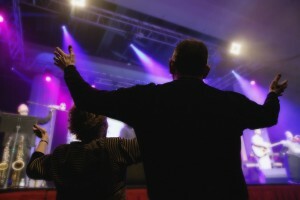 Aside from creating a more dynamic connection, there are endless practical benefits such as conveying song lyrics, presenting special messages and announcements, reaching members in the back of a large hall, making sermons and other audio feeds loud and clear, making the service a more powerful and interactive experience, lighting that makes alters, pulpits or projected images clear to everyone in attendance, or even broadcasting a service on local television. As with any other building, these facilities pose their own unique challenges created by their size, acoustics, lighting and other factors. We understand the challenges and can create a system that is simple-to-use, yet helps to deliver a powerful experience.